iii) A Processing Unit, often simply a PC, which takes recorded data from the interrogator and performs further data processing, user interfacing, data transmission and storage functions. The fibre Bragg grating (FBG) is an optical sensor recorded within the core of a standard, single-mode optical fibre using spatially-varying patterns of intense UV laser light. Short-wavelength UV photons have sufficient energy to break the highly stable silicon-oxygen bonds, damaging the structure of the fibre and increasing its refractive index slightly. A periodic spatial variation in the intensity of UV light, caused by the interference of two coherent beams or a mask placed over the fibre, gives rise to a corresponding periodic variation in the refractive index of the fibre. The grating formed at this modified region of fibre becomes as a wavelength selective mirror: light travelling down the fibre is partially reflected at each of the tiny index variations, but these reflections interfere destructively at most wavelengths and the light continues to propagate down the fibre uninterrupted. However, at one particular narrow range of wavelengths, constructive interference occurs and light is returned down the fibre. where neff is the effective refractive index of the mode propagating in the fibre and Λ is the FBG period. Equation (1) implies that the reflected wavelength λΒ is affected by any variation in the physical or mechanical properties of the grating region. For example, strain on the fibre alters Λ and neff via the stress-optic effect. Similarly, changes in temperature lead to changes in neff via the thermo-optic effect and in an unconstrained fibre, Λ is influenced by thermal expansion or contraction. This situation is expressed in Equation 2, where the first term on the RHS gives the effect of strain on λΒ and the second describes the effect of temperature. where ΔλΒ is the change in Bragg wavelength, ρα, α and ξ are respectively the photoelastic, thermal expansion and thermo-optic coefficients of the fibre, Δε is the change of strain and ΔT is the temperature change. For a typical grating written in a silica fibre and with λB ≈ 1550 nm, sensitivities to strain and temperature are approximately 1.2 pm/με and 10 pm/ºC respectively. Importantly, the two terms of equation (2) are independent, meaning that the FBG can be used to make temperature measurements by isolating the fibre from strain, and temperature compensated strain measurements can be made with knowledge of the temperature, often conveniently derived from a second, strain-isolated FBG. 1. An interferometer may be used to convert wavelength shifts into phase shifts, which can be detected by measuring variations in the light intensity as the path difference in the interferometer is varied. This technique potentially allows for very high sensitivity, but the equipment to do it is expensive and prone to environmental interference. 2. A sloped optical filter, which may be another Bragg grating, can be used to convert wavelength shifts directly into intensity changes. If the filter is designed to have a known pass/reject ratio which varies with wavelength, then the wavelength of a narrowband reflection from a single grating can be determined simply by measuring and comparing the passed and rejected intensities. This is the simplest and cheapest way of demodulating FBG, but it has the important disadvantage that it can address only one grating at a time. 3. A time division multiplexing (TDM) system, which employs a pulsed broadband light source and identifies different gratings of the same wavelength by the time taken for their return signals to reach a detector (the returns from closer gratings are received before those from more distant ones). A system of passive sloped filters, as per 2. above, can be used to determine the wavelength of each pulse as it arrives. Alternatively a high-speed spectrometer can be used. The Key disadvantages of TDM systems is the requirement to have low reflectivity gratings, and to maintain a minimum spacing between the gratings to allow the interrogator enough time to make a wavelength measurement. These disadvantages often limit the performance and practicality of a TDM measurement system. 4. A wavelength division multiplexing (WDM) system, in which many gratings can be combined on a single fibre and addressed simultaneously provided each has a different Bragg wavelength. This is achieved in practise either by using either a broadband light source and a spectrometer for detection, or an agile tunable or swept-wavelength light source and simple photodiode detectors. Smart Fibres employs the latter method in its interrogation units and the diagrams below will help to illustrate how they work. Schematic and operating principle of WDM equipment. Key: a) light source, b) scanning filter, c) scan generator, d) coupler network for channels 1-4, e) FBG arrays, f) photo-detectors, g) processor and h), time varying output of the detector on channel 4, showing times t converted into Bragg wavelengths λ. The scan generator tunes the light source, sweeping it back and forth across its range such that at any given instant the wavelength of light being transmitted down the fibres is known. When this wavelength coincides with the Bragg wavelength of an FBG, light is reflected back down the fibre to a photodetector. The scan generator also supplies a timing signal to the processor, allowing it to convert the intensity vs. time information into a spectrum. Further processing is performed to identify peaks in this spectrum, find their peak positions and convert these to strain or temperature. Smart Fibres' opinion is that tuneable laser WDM technology offers the best price/performance ratio available and, therefore, our FBG interrogators adopt this operating principle. All Smart Fibres’ FBG interrogators incorporate our SmartLaser core technology. SmartLaser core defines a combination of proprietary techniques and engineering processes that allow us to obtain the best possible performance from an otherwise standard telecoms tuneable laser. Thanks to innovative tuning techniques we can achieve reliable operation of the laser at very high scanning speeds with excellent resolution and repeatability results. This is only possible thanks to a sophisticated thermal management system that efficiently extracts the heat generated by the laser independently of the external temperature. FBG sensors and transducers are completely passive and use no electronic components. As a result they are capable of operating under extreme operating temperatures from cryogenic to several hundred degrees centigrade and offer long-term survivability in the most extreme environments where electronic sensors and gauges are unable to operate. Optical fiber is a very efficient signal carrier. Because of this, the electrical interrogation unit can be sited many tens on Kms away from the sensing location, whereas conventional electrical strain gauge systems require regular amplification to avoid signal to noise degradation. For monitoring long, remote structures such as wellholes, risers, pipelines or tunnels, this is a unique and invaluable benefit. Optical sensors are immune from down-lead effects and, since the measurand in a FBG sensing system is wavelength which is unaffected by signal attenuation, it is not possible for the value of a remote sensor to be corrupted whilst being transmitted along a long fiber. The fiber into which FBGs are recorded is tiny, just 0.15 mm or so in diameter. The means that many sensors can be applied to a structure with very little intrusion. Uniquely, a fiber sensor array can be embedded inside a composite to monitor internal strain, temperature and damage with no effect on the structural performance of the composite. 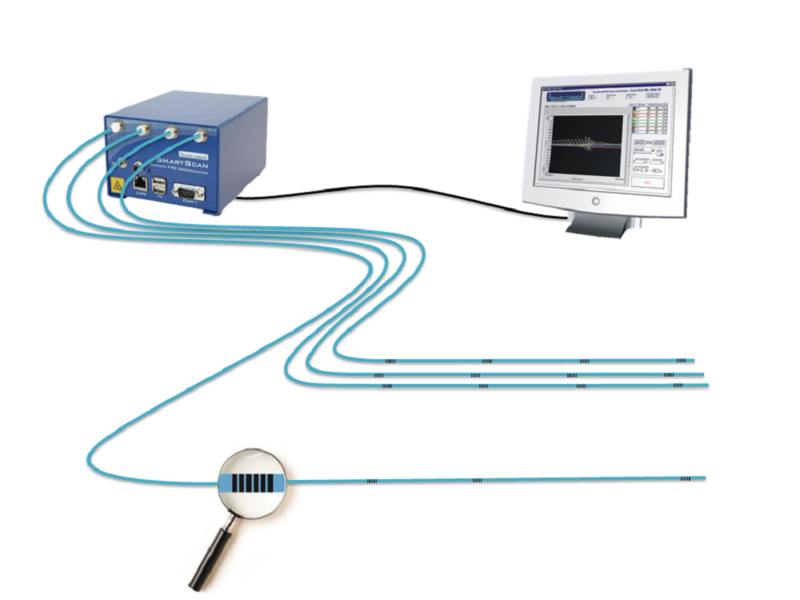 Many tens of FBGs can be written into one optical fiber, and several hundred can be simultaneously interrogated by one multi-channel instrument. This provides a very low-cost mechanism for densely instrumenting even very large structures, when compared with technologies where every sensor has a dedicated channel. Furthermore, optical fiber is smaller and much lighter than electrical wire and, together with this multiplexing capability, extensive FBG sensor installations can be made that were hitherto impossible in certain applications due to cable mass and volume. Tests with carbon fiber coupons have shown that embedded fiber sensors show no signs of fatigue or disbonding after one million cycles. Similar tests with glass fiber materials will demonstrate that embedded sensors within wind turbine blades for instance will survive the 25-year service life of the blades themselves. For surface mounted applications, optical fiber sensors are less prone to disbonding and are far more resilient to moisture and chemicals than most electrical gauge technologies. Consider installing a large number of conventional electrical strain gauges. Each gauge needs to be bonded to the structure under test and then the bond pads associated with each gauge need to be bonded. Solder joints then need to be made in-situ between each gauge and its associated bond pads. Then electrical wires need to be soldered in-situ to all of the bond pads and then routed and secured back to the bank of instruments. Finally, the electrical bridge associated with each gauge needs to be balanced before measurements can commence. By comparison, the structure can be instrumented by hundreds of FBG strain sensors simply by bonding a few optical fibres to the structure, connecting them to a single FBG interrogator and pressing a single button to take a strain array reference that is valid for all future readings. Bearing in mind that the installation engineers are skilled labour, and access to certain structures is difficult and expensive, the cost and time savings available through an optical fiber installation are clearly significant. Smart Fibres have been working with FBGs for many years and have developed some novel solutions for applying them to all manner of structures. Details of these Smart FBG sensors are to be found in our Products pages.